Mid-Week Mini: Zebra Sarasa Clip - Vintage Colours. The Zebra Sarasa Clip is my favourite gel ink pen. I have found them the most consistent gel pens giving me a smooth line and starting up even if it hasn’t been used for a while. I like the 05 tip size as I find the line width thin enough and I don’t feel like there is any friction on the page when writing. I wrote a review of the Sarasa Clip back in 2016 which you can find here. However I think the gem in the Zebra Sarasa Clip world are the Vintage colours. I was bought one of these pens by Priya from The London Parchment a few years ago in the blue-grey and I used it a lot! It was subtly different to anything I had tried before. 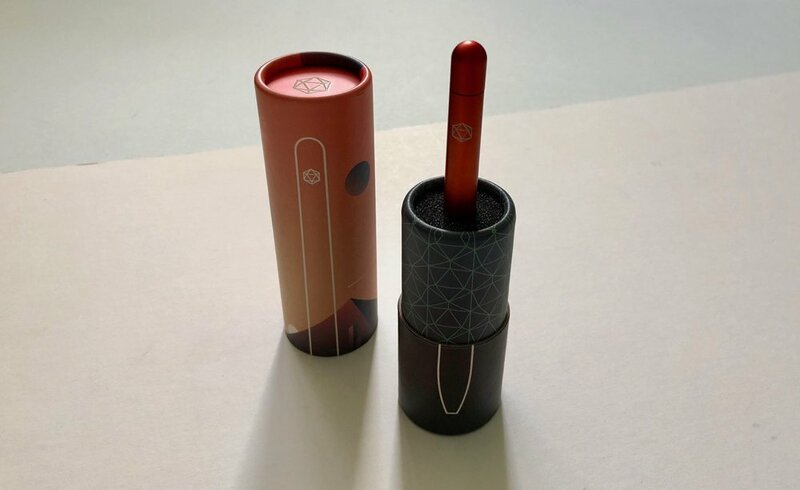 The only downside at the time was they weren’t available in the UK, but that problems now resolved and you can grab these from Cult Pens. In todays post I will share with you the different colours available and try to explain why I love this pen so much. There are a range of muted tones in the Vintage line, Green-black, Blue-grey, Brown-grey, Red-black and Blue-black. I didn't bother buying the Blue-black, because, well...it’s blue-black and I kinda know what to expect from that colour. I was far more interested in the other options that came within this range. The Vintage colour choices are traditional colours, but those you would expect to sit within Vintage theme. My favourite is the blue-grey as the colour is subtle but different to any other blue gel pen I have tried. There is a lovely lightness which comes from the grey tones dulling the blue pigment. It works nicely though to give a subdued blue and manages to make a standard ink colour a little more interesting. The brown-grey is my least favourite of the four mostly because it doesn't stand out against the other Vintage colours. Interestingly the grey element of this colour actually works well and really alters the brown colour nicely. Pairing this with the black would have been a mistake and perhaps darkened it too much, but the grey is distinctive and quite nice. The Red-black and Green-black sit somewhere in the middle. I like both and they feel very British reminding me a lot of Mini car colours. There is a vibrancy that you don’t get from the blue or brown inks. There is a hint of a teal shade in the green-black and the red is very bright. 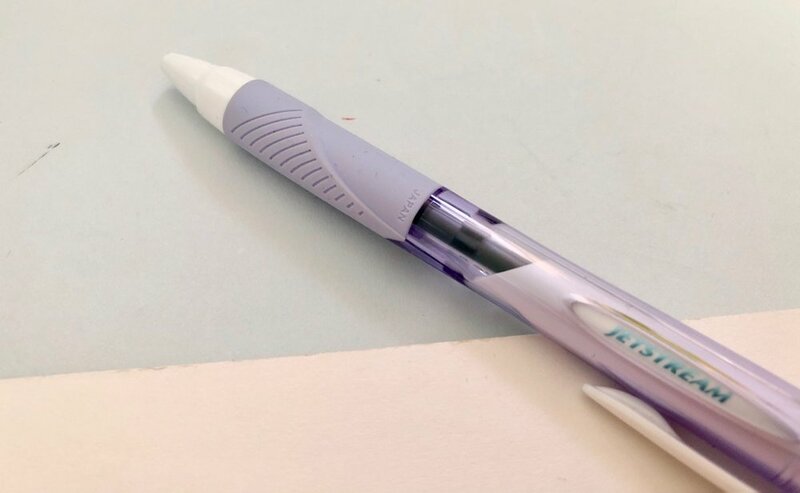 The Zebra Sarasa Clip gel pen, especially in these Vintage colours, is my favourite gel pen to use. 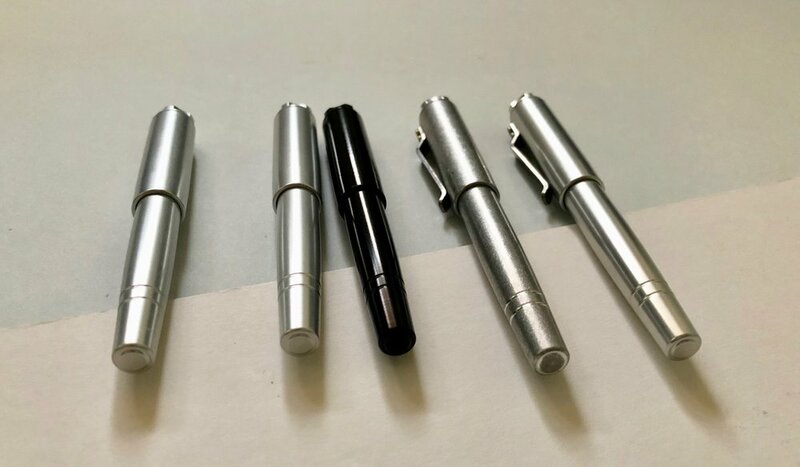 I often use these as an everyday pen and with my Travelers Notebook because you get a fine point. These pens are a great price too at £2.40 per pen. This is the higher end of a gel pen price but totally worth it for such a different and distinctive gel pen in a cool range of colours. 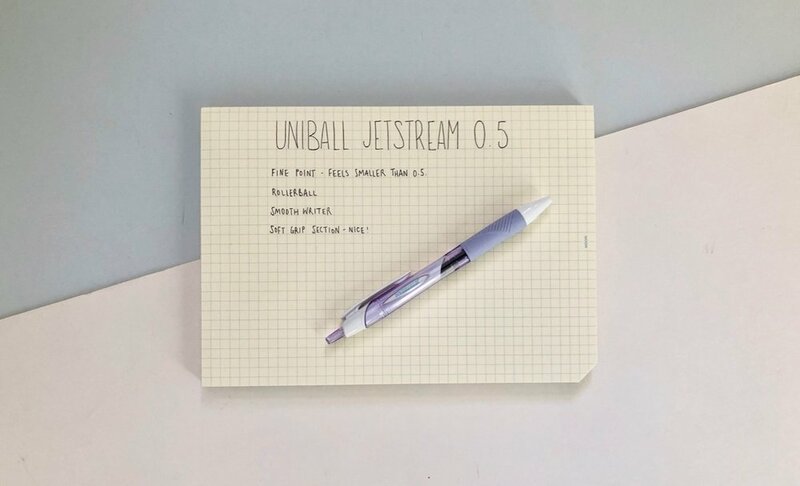 The Uniball Jetstream is usually the pen that is recommended to people when starting to look for a pen that’s ‘a little bit nicer’. There is good reason for this but in today’s post I thought I would dig into this pen a little more and give my thoughts. 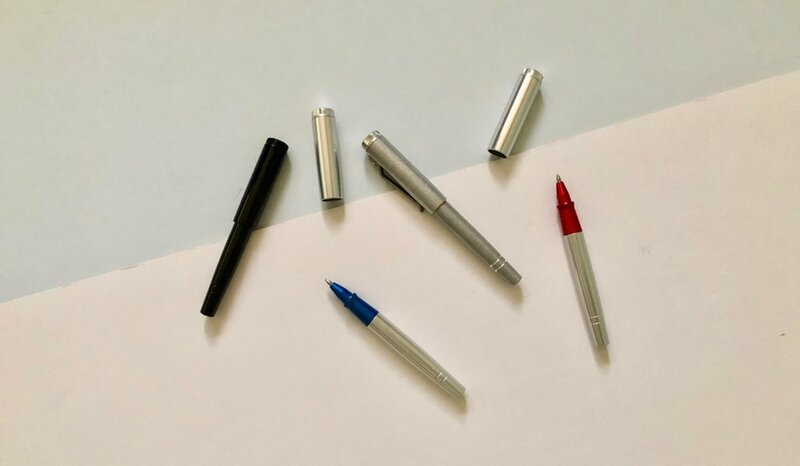 The Jetstream is an entry level pen, one that you could use everyday but you won’t cry if you lose or misplace it. The Jetstream is a rollerball with its big selling point being an ‘ultra-quick-drying hybrid gel ink’. To add to this the ink is waterproof and fade-proof. 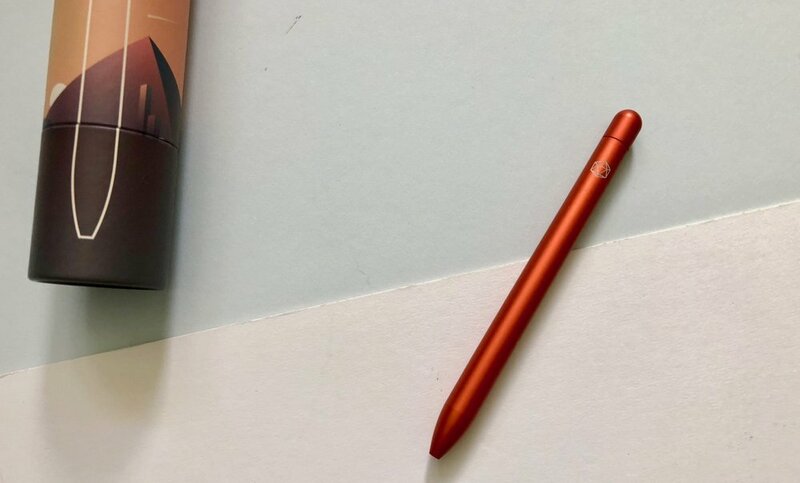 Essentially in this one entry level pen you’re getting a lot more than a standard pen which makes it incredibly versatile and a great recommendation to a budding pen addict. I bought my Jetstream from an actual shop, shocking I know, so I think I have the Sport version. It’s a lovely pastel purple colour with white accents. There is a clip, which I never use, and a nice soft grip section. 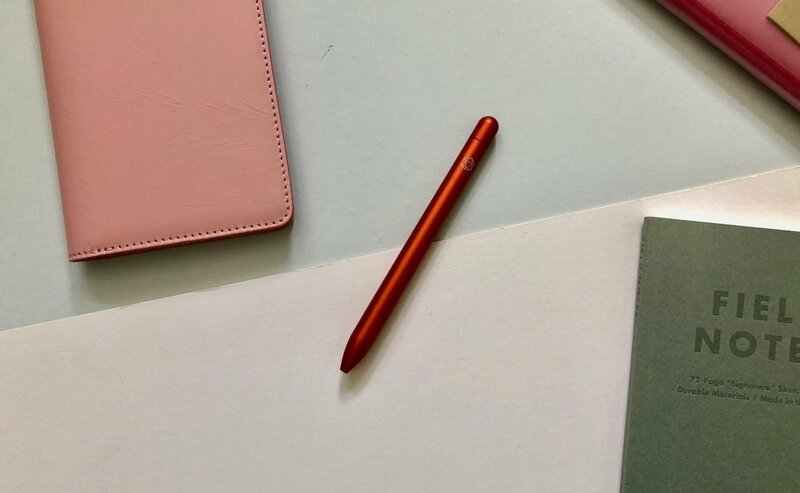 Sometimes these can be overly padded and get in the way but the Jetstreams grip section is comfortable making it easy to use for long periods of writing time. I am not an everyday user of the Jetstream despite it’s many benefits. There are so many pens to use that the Jetstream rarely gets a look in. Mine has a 0.5mm refill which gives a very thin line, which looks much thinner than the 0.5 advertised. The ink is smooth and works really well on your nicer paper, such as the MD Paper in my writing sample below, but also standard printer paper. I am a fan of Uniball pens as a whole. They always write well and feel good to use, the ink is smooth and dark and rarely skips or gives any glooping issues. The Jetstream is no different. It’s a great pen to have in your arsenal and despite my sporadic use it always works first time. Sometimes it’s not about the expensive or finding the new thing to enjoy stationery or writing tools. Using the simple can be refreshing and enjoyable.